The Body-Solid GSCR349 Seated Calf Raise Machine is a combination of user-friendly ergonomic design and advanced biomechanical engineering, the GSCR349 was created to increase calf muscle interaction and speed the rate of development. This is achieved by the use of a unique foot platform design that eliminates stress compression on the ball of the foot while providing maximum range of motion for deep muscle fiber penetration. The weight carriage is designed for a 3:1 weight ratio and pivots on precision pillow block and sealed ball bearings for smooth friction-free movement through heavy-duty calf-blasting workouts. 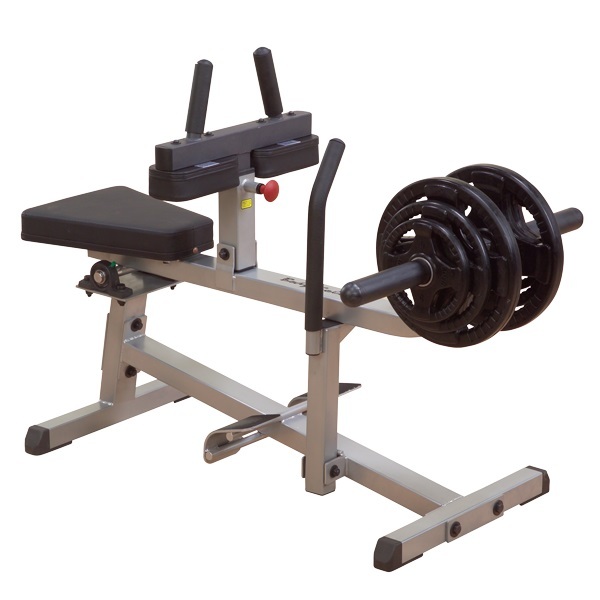 In order to carry the heaviest loads, the main frame is constructed of 2" x 3" 11-gauge high-tensile strength steel, making the Body-Solid GSCR349 Seated Calf Raise Machine perfect for high traffic, heavy use gyms and clubs. Super-durable, full 3" thick DuraFirm™ padding supplies the comfort even during workouts with enormous poundage. The Body-Solid Lifetime In-Home Warranty and Full Commercial Warranty back the best calf machine in the industry. The Body-Solid GSCR349 Seated Calf Raise Machine is designed to provide an intense workout while eliminating strain, the Body-Solid GSCR349 Seated Calf Raise Machine pieces are hard to beat. Easy and convenient step in entry makes getting started a breeze. Thick, comfortable DuraFirm™ pads reduce fatigue and discomfort allowing you keep working out. Rock solid support and stability is delivered via heavy-gauge steel frames with all-4-side welded construction. The fully shrouded weight stack offers a safe and attractive machine that is sure to be a hit in any facility. Some of the Body-Solid GSCR349 Seated Calf Raise Machine features are thick, comfortable DuraFirm pads that reduce fatigue and discomfort allowing you keep working out. Rock solid support and stability is delivered via heavy-gauge steel frames with all-4-side welded construction. The Body-Solid GSCR349 Seated Calf Raise Machine is specially designed to focus on your calves. The Body-Solid GSCR349 Seated Calf Raise Machine is one of the best ways to work your calves in a safe and efficient manner. Call 1-800-875-9145 to chat with one of our fitness agents with any questions you may have about the Body-Solid GSCR349 Seated Calf Raise Machine. 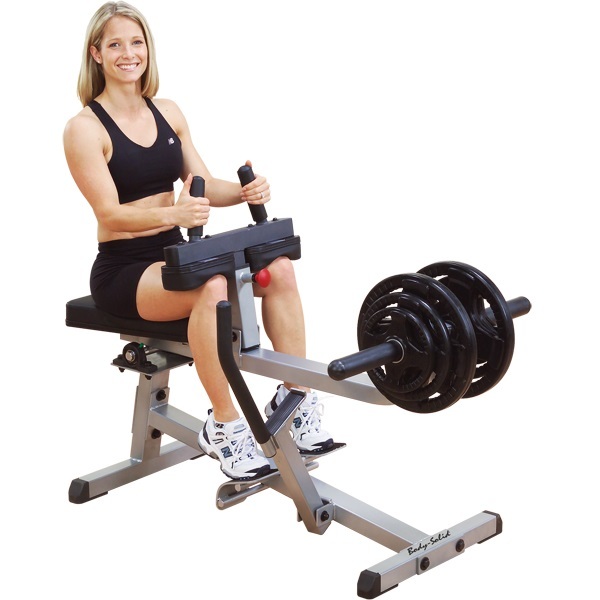 Order your Body-Solid GSCR349 Seated Calf Raise Machine from FitnessZone.com today! A combination of user-friendly ergonomic design and advanced biomechanical engineering, the GSCR349 was created to increase calf muscle interaction and speed the rate of development. This is achieved by the use of a unique foot platform design that eliminates stress compression on the ball of the foot while providing maximum range of motion for deep muscle fiber penetration. The weight carriage is designed for a 3:1 weight ratio and pivots on precision pillow block and sealed ball bearings for smooth friction-free movement through heavy-duty calf-blasting workouts. In order to carry the heaviest loads, the main frame is constructed of 2" x 3" 11-gauge high-tensile strength steel, making the GSCR349 perfect for high traffic, heavy use gyms and clubs. Order your Body-Solid GSCR349 Seated Calf Raise Machine from FitnessZone.com today!